Located northeast of Scottsdale, north of Fountain Hills, Rio Verde real estate is surrounded by nature preserves! This adult community requires that at least one of the homeowners are 55 years of age or older. With two golf courses, pools, tennis and lots of social activities, this is a very nice place to live. Development began in 1973, and has almost reached completion. This means there are still new homes in Rio Verde! Rio Verde features about 1080 homesites plus 20 acres dedicated to commercial developments and 230 acres of recreational or open space. The population is expected to reach about 1800 once the newest developments have been finished and sold. Homes in Rio Verde are built on rather large lots, and the landscaping reflects the native desert and is not overly manicured. If you like a quiet community, this one's for you. Home prices range from $400k to $2m. Very few homeowners associations means more personal freedom for you. Located in the heart of the high Sonoran Desert, it features golf and a host of amenities designed for the discriminating lifestyles of today's active adults. The community is comprised of 735 acres of low density real estate featuring custom homes and captivating villas. Each piece of Rio Verde real estate features scenic views including the surrounding desert, the Tonto National Forest or the manicured fairways of the two 18-hole golf courses. 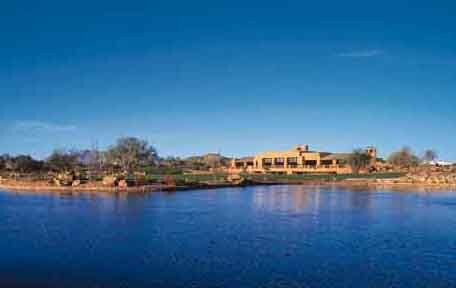 Experience a lifestyle no other Scottsdale real estate can measure up to at Rio Verde.